The museum has two model train tracks from the German manufacturer LGB. LGB was a German toy manufacturer who made model trains and other toys from the start of the 20th century. With a scale of 1 on 22 the LGB trains are the largest model trains made. Our tracks are hanging from the ceiling, this means you can see the trains from our café as well as the ground floor. The bottom track contains our collection of silent trains. This is an assortment of mostly Dutch trains a few of which have been specially hand made for the museum. This track is fully automated. Through a complex electrical system these trains will drive, stop and change track at the press of a single button. The upper track contains our most luxurious trains. These trains make all the sounds you would expect their life size counterparts to make. You will hear the trains whistle when they leave the station and fill their ovens with coals when they return. The train carts are lit up from the inside and in the seats miniature people enjoy their ride. All this leads to a realistic experience. We also have some models from well-known trains such as the Swiss Rhätische Bahn and the American Southern Pacific. 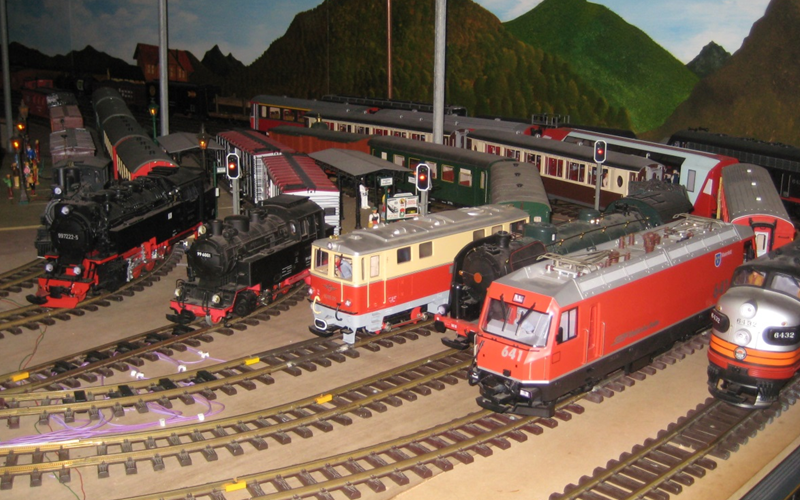 You are more than welcome to take a look at our model trains, after all our trains are always on time!